The tradition of Salisbury athletic success at the state level began in 1962 with the school’s first state championship in Indoor Track. Wayne Kelley was a member of that successful Salisbury squad and has been a valued contributor to several projects in the school over the past 40 years. So at the beginning of the 2017/18 school year, Mr. Kelley’s experience was sought once again by school administration to help complete a vision for a trophy case in the high school lobby. He began by taking some measurements for the trophy case that would house the 32 state championship and final four trophies Salisbury teams have accumulated since his own graduation. The case was not without complications because it needed to be able to bend to the shape of the rounded gym wall. As a result of the complexity of the project, Mr. Kelley enlisted the expertise of his brother-in-law, Jim Morris. Together the case began to take shape over the course of several months of labor. The oak wood for the case was milled just north of Macon, and then it was stained, and assembled locally. The case measures 15’ long X 8’ high X 16” wide. On Thursday January 25, the trophy case was delivered with the final glass installed. The lighting and electric was installed by the school head of maintenance, Rick Conway. 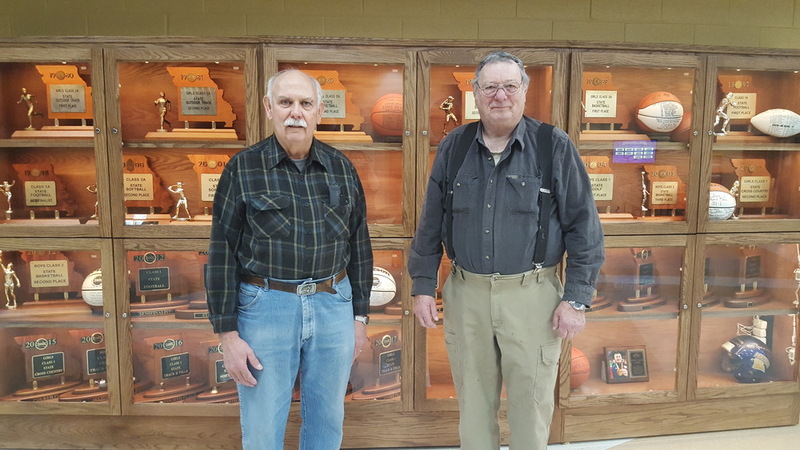 The school would like to show our appreciation for Mr. Kelley’s and Mr. Morris’s hard work by attaching a plaque with their names recognizing them for their contribution to the school’s athletics programs.